These illuminations were removed from choirbooks, as indicated by the text on the back of the fragments. It is uncertain whether they were taken from manuscripts that were mutilated in the process, or whether they were salvaged from manuscripts that had been slated for recycling. Liturgical texts were often scrapped when they were considered outmoded. 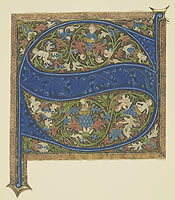 [top] Initial "S" from a Gradual. Germany or Bohemia, fifteenth century. 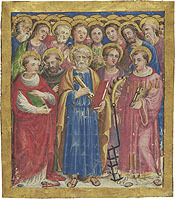 [bottom] Miniature: St. Peter and Assembled Saints. Italy, early sixteenth century.